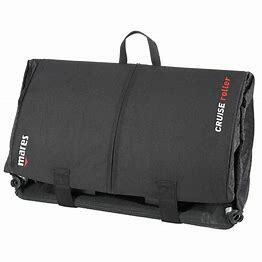 The Mares Cruise Roller Bag is a light weight yet sturdy bag that will hold all of your scuba diving equipment for travel or storage. It can be wheeled around on the durable wheels using a comfortable mesh handle or it can be carried on your back using the adjustable padded shoulder straps. The shoulder straps can be tucked away in a pocket style area on the rear of the bag to keep them out of the way. The best feature of this particular bag is the fact that it folds down to 1/3 of its own size to be stowed away when not being used. 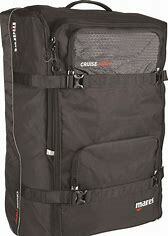 It folds down easier and quickly and has velcro straps to hold it all in place. There is a large 28 Litre internal pocket that will hold all of your diving equipment or even simply clothes for a holiday when your not diving. There are 2 extermal fin pockets that run down either side for the bag and another 2 handy pockets on the front that can hold clothes or travel documents. 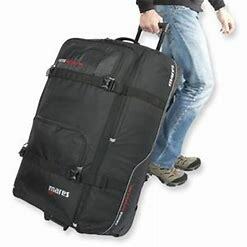 The Cruise Rolle rbag only weighs 3kg's so it wont take up too much weight when you are travelling and have to wt=atch hold much weight you have including the bag. The bag measures 47cm x 32cm x 81cm when it is is full of gear.